Electric cars, whether you want to believe it or not, are becoming a "thing." While they still look and drive like cars, there are certain key differences when they get into a fiery accident. This is what you need to do if that car fire happens. Hi. Why are you in my house? ...are you trying to sell me something? No. I noticed you have a BMW i3/Tesla Model S/Coda/Nissan Leaf/Other electric car outside and wanted to fill you in on fire safety. There's no fuel tank. I don't need to worry about a fire. Goodbye. Hold on a second. Worry might be the wrong word, but you should be cognizant that it could happen. Older batteries had metal particles in them that could possibly cause a short, but that isn't really the case any longer. But during charging, the batteries can get very, very hot. If the connections come loose on batteries, an arc can form which could also cause a fire. We've also seen an accident that compromises the integrity of the battery pack can cause a fire. So what? I'll just pour a little water on it. Job done. Why? A little bit of water puts out fires. Duh, dingus. Not true. Some water might put out the fire briefly, but it won't extinguish it. Yep. The insides, or innards, if you will, of the battery (typically a lithium ion battery) are still hot. In the past, it was said to not use any water on a lithium battery fire, because the metal contained within required an expensive extinguisher. Now, water plays an important role in extinguishing the fire: It cools the battery. Cooling the battery reduces the chances that the fire will reignite. It's what airlines learned as a best practice during the Boeing 787 fires earlier this year. Ah, so water is the answer? Sort of. Battery fires are notoriously fickle and can take nearly 24 hours to be fully extinguished. So even if the fire ends, it can restart on its own. You also need to make sure that the first responders know that the car is electric. They see a lot of car fires, but not many electric car fires. It'd be a good idea to let them know exactly what they're dealing with so they can respond appropriately. You're telling me. Oh, remember, don't touch the battery, unless you want to be very electrocuted. Tesla has a pretty comprehensive guide for what to do if one of their cars catches fire, but it's also a good guide for any of the modern generation of cars powered by lithium ion batteries. A thermal imaging camera is recommended to make sure the battery is fully cooled. If it's still smoking, it isn't cooled down and may actually be heating back up. Put more water on it! The car also needs to be stored in an open area after the crash with nothing nearby. Again, make sure to tell the people towing the car away that it still might be a fire hazard. Yeah. Remember the Chevy Volt fire? 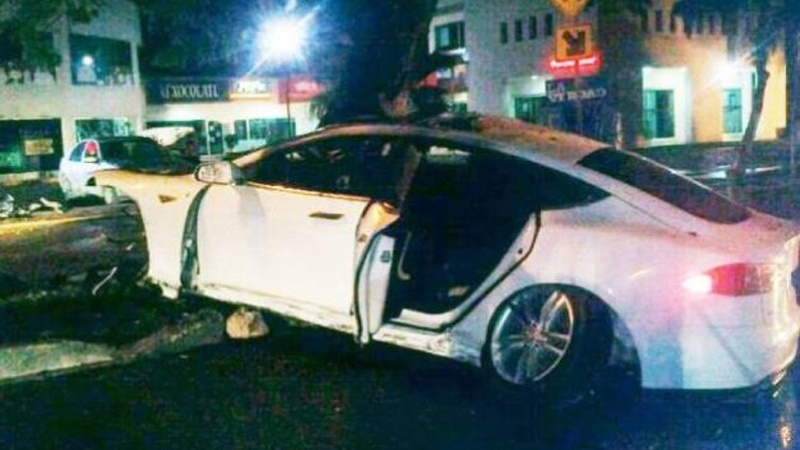 That happened because post-crash precautions for the lithium-ion batteries weren't followed. Then the fire started and news outlets the world over deemed the Volt an immediate fire risk. The same hoopla surrounded Tesla when a fire started after a crash. Point is, electric cars can catch fire in certain situations (just like a gas powered car) and since they're new, people will freak out about it for a while. Fire crews might also have a tougher time putting out the blazes. Do the same sort of rules apply to cars with a gas-powered range extender on board? Like a Fisker? Yep. 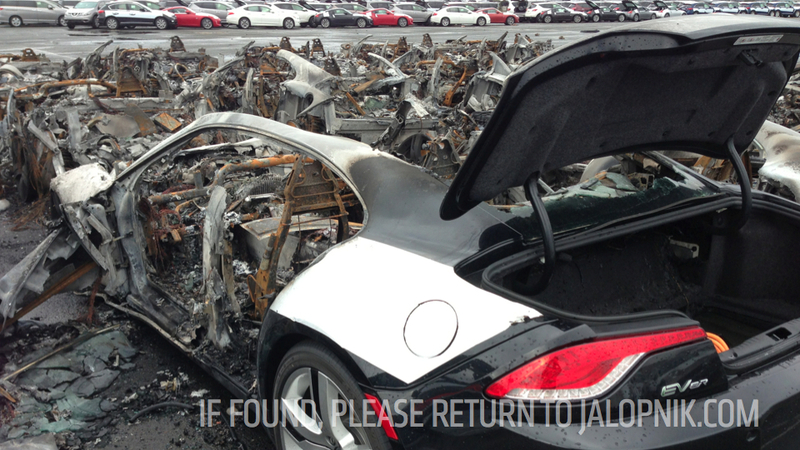 Fisker Karmas caught fire after a submersion in salt water after Hurricane Sandy last year. Fiskers have also been involved in a number of other fires, which may or may not have been related to batteries and the exhaust of the range extending gasoline engine. So my car will definitely start on fire in a crash? No. There have been about two electric car fires that were noteworthy in the last year. 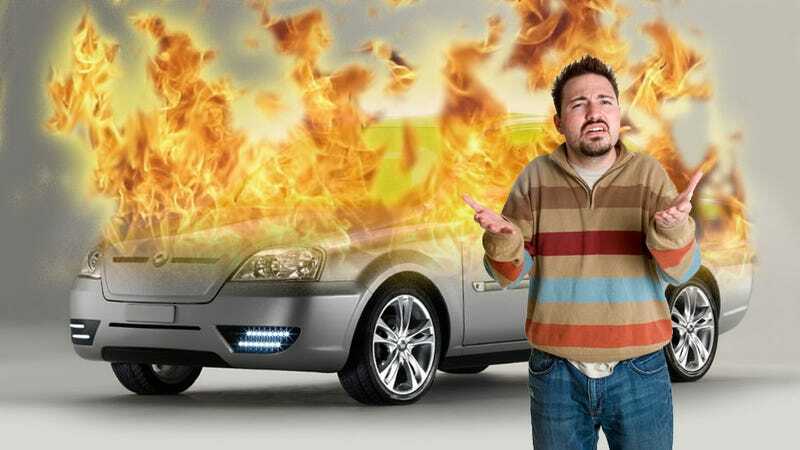 From 2006 until 2010, there were about 152,000 car fires per year. Electric cars make up such a minuscule part of that they're barely a percentage. Did you listen to me at all? Eh. I drifted in and out.